February is the month of love! I’m sure we have Hallmark to thank for that, but I’m all for sharing the love no mater where it originated from. This month I’m participating in two yoga challenges on Instagram. I’m doing the #LetsGetFlexyin2015 sponsored by AloYoga and the #Open4Love challenge! What better way to show love than to love your own body to begin with! I highly encourage you to love your body with some yoga poses each day this month. If you aren’t one for doing a challenge for an extended period, there are a few that are for only half the month. Check these wonderful challenges and me out on Instagram @Andrea_fromfltond! This entry was posted in Fitness Challenge, Yoga and tagged #letsgetflexyin2015, #open4love, daily yoga practice, yoga, yoga challenge on February 1, 2015 by fromfltond. I’ve begun my 200 RYT Aerial Yoga certification!! My trip down to CircuSoul in Florida for the beginning of my training was amazing! I was in heaven from the time my flight took off! 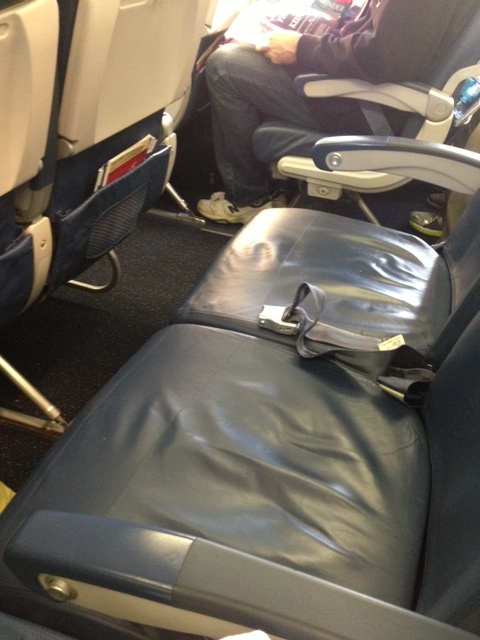 I had to share this picture with you of the two empty seats next to me on the flight down to Orlando. That’s right!! I had the whole row to myself!! Woo Hoo!! Never has this happened to me before. Our flight didn’t have very many passengers, so many of us were spread out and really enjoying our flight! I even got to finally watch Maleficent during the flight down. Totally loved that movie too! 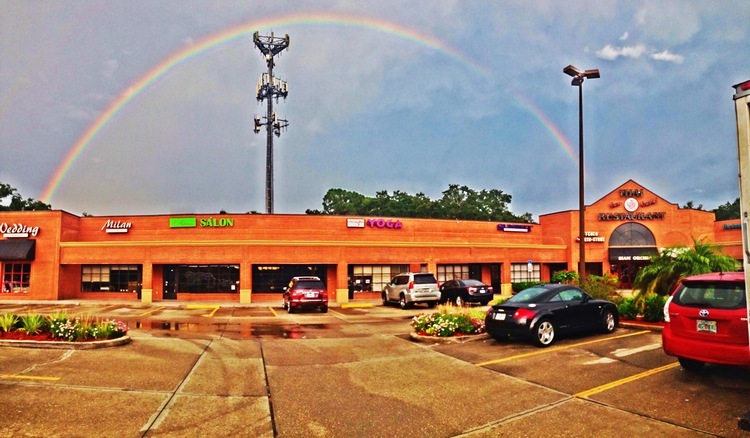 Once I arrived I headed over to my favorite mall in Orlando, Mall at Millennia, and did some shopping! 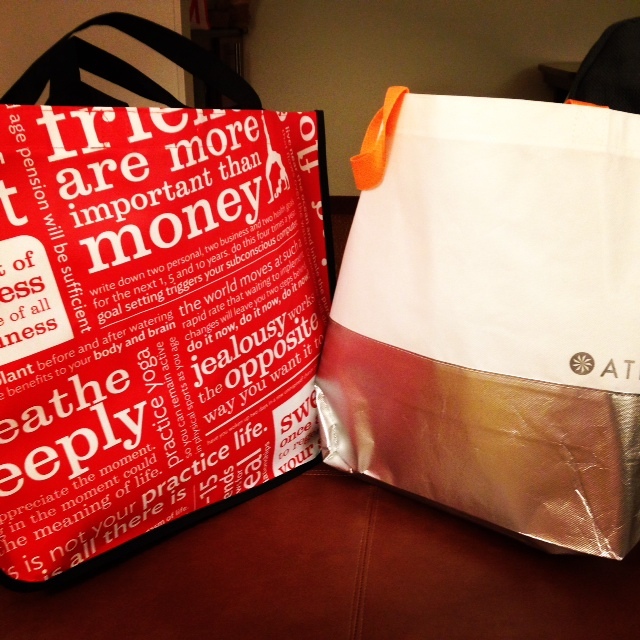 Ya know…a few more workout pants and tops. A fitness instructor is always in need of these…At least that’s what I tell my husband. The credit card company just calls him and tells him I’m at it again. 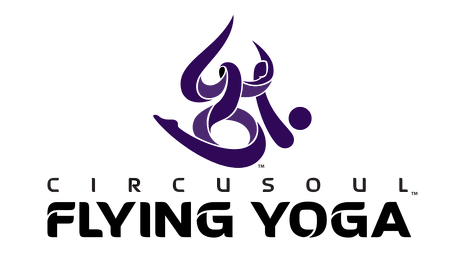 I was up early Saturday morning and ready to begin my Level1 aerial yoga at CircuSoul. Not to mention I was excited to finally meet Kerry Tice in person. We have talked on the phone quite a bit over the years, but never talked in person. In person Kerry is an amazing instructor/teacher/trainer, and is beyond dedicated to aerial yoga as a practice. The beginning of our training (Level 1) focuses on teaching you a lot about aerial yoga with emphasis on safety and postures. This YouTube video is a quick snip of Flying Yoga A. 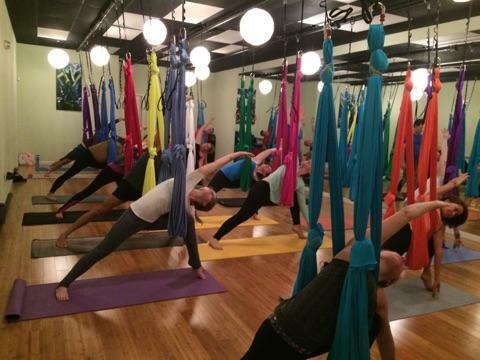 Both days we began our day with an amazing aerial yoga class that both stretched and strengthened my body. Our beginning warm up flow had us flowing between cat and cow with one leg extended in the hammock. We did several flows using the hammock. My favorite being a basic Warrior flow moving you from Warrior II, to Reverse Warrior, back to Warrior II, and then into extended side angle. This is all done with one leg resting in the hammock. It felt amazing! 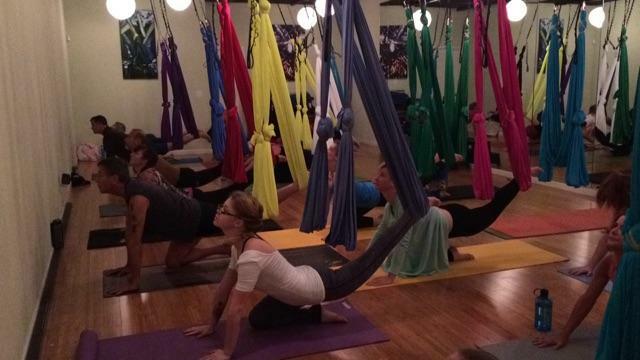 I’m the one on the yellow yoga mat, using the green hammock, and wearing the blue tank top. Then, it was on to working on inversions! Sorry there are not more inversion pictures from the training. We were just so busy the whole time. The best part is when you get to “cocoon” in your hammock at the beginning and end of class in Shavasana. Sadly I’m always one of “those people” who always get up right at the end of a yoga class and barely spend any time in Shavasana. 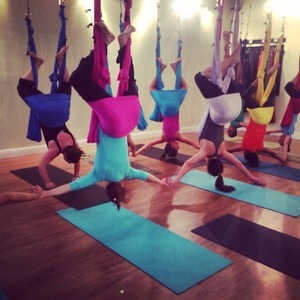 Well, with aerial yoga that has changed a ton. Even in my hammock at home I have a hard time willing myself to come out of Shavasana. You feel so safe and relaxed in your hammock. After our morning classes on each day we began to break down the poses we learned and are learning in Flying Yoga A. Then, we would break for lunch. After lunch we came back and went over the anatomy and how it applies to aerial yoga with Dr. Britt. For our first two days of training we went over the structure and make of our bones, the pelvis, psoas, and shoulders. Dr. Britt was and amazing anatomy teacher, and has us all engaged in the muscle and bone structure. I’m looking forward to learning from in her in our future trainings! Here we are discovering our iliopsoas and its length by monitoring our ischial tuberosities for movement as the leg extends! It was such an exciting and informative weekend! After our anatomy lesson it was on to practice teaching with others in our class. I’m one of those dorky people who love the practice teaching parts of our certifications. Since I’m a perfectionist when it comes to instruction, I want to make sure I’m cueing correctly and correctly fixing any form issues that may arise during class. All in all it was an amazing beginning of our training. I’m looking forward to our next weekend of training in February! 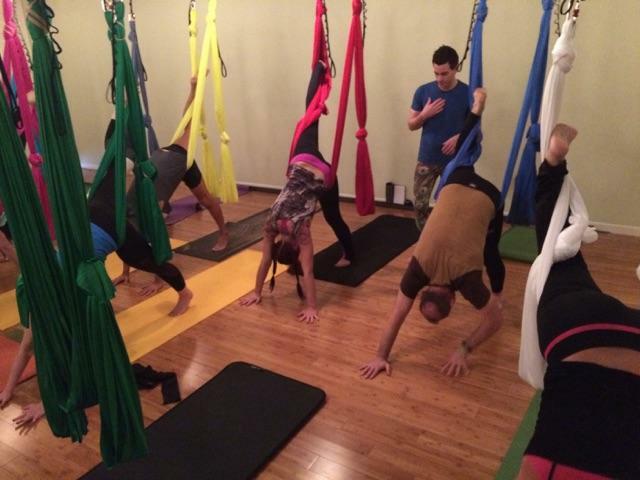 This entry was posted in Aerial Yoga, Florida, Yoga and tagged 200 RYT aerial yoga certification, aerial hammock, aerial yoga, aerial yoga certification, aerial yoga certification Circusoul, CircuSoul on January 21, 2015 by fromfltond.